At least eleven other people were injured Tuesday, some of them critical in and around the volcanic eruption near a ski resort in central Japan, officials said. Most of the injured were on the ski slopes, while some were in a gondola where glass was broken apparently by a flying rock, said Makoto Shinohara, an official in Kusatsu town. The Japanese military said six soldiers who were among about 30 on ski training were buried by a nearby avalanche, but they were all rescued. 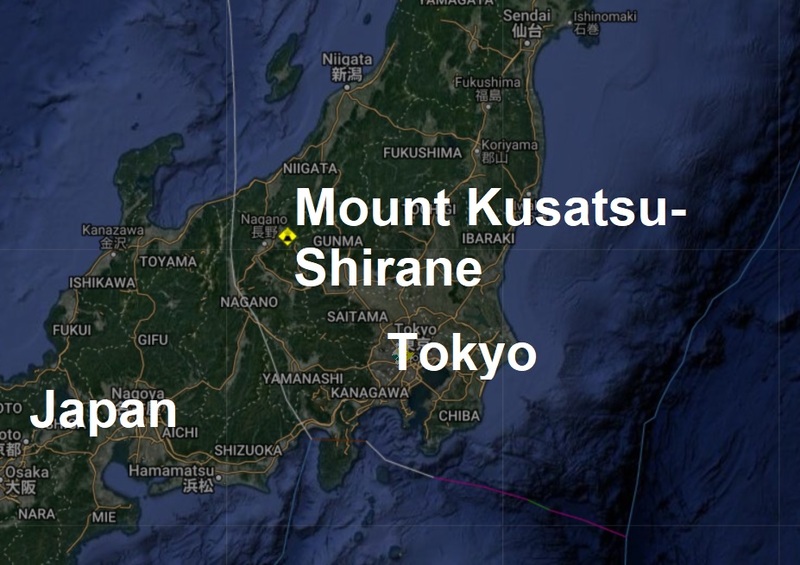 The Japan Meteorological Agency says snow-covered Mount Kusatsu-Shirane erupted around 10 a.m.
Mount Kusatsu-Shirane which is located less than 100 miles from Tokyo erupted Tuesday morning sending black smoke and rocks a mile-wide area as well as down the mountainside, however, officials are still unsure if the eruption caused the avalanche. Reports of several people injured by falling rocks from the eruption. According to the BBC, at least 78 skiers were still trapped at a rest house on top of the mountain by Tuesday afternoon, according to a local town official. Yesterday a rare snowstorm hit Tokyo, snarling train services, forcing the cancellation of scores of flights and prompting hordes of workaholic Japanese to heed official advice to head home early. Snow began falling on Monday morning, with as much as 10 cm (4 inches) predicted for central Tokyo by the time it is expected to stop early on Tuesday. Around 250 flights from Tokyo's Haneda airport were cancelled.